A few weeks ago I traveled to Nürburg, Germany with Kinetic Fin to shoot material for a documentary series on Jim Glickenhaus and his Ferrari P 4/5 Competizione, a remarkable one-off supercar. In June, the car will compete in the 24 Hours Nürburgring endurance race. Last week was qualifying and testing. Going into this first trip (we'll be going again for the 24H, and possibly one more time before), very few details were known by the crew. Where were we to stage? Where could we shoot from? What exactly is the schedule for the race? We knew the car, we knew what it set out to do in Nürburg, but we were in the dark as far as logistics went. So we considered this trip somewhat of a scout and just went into it open-minded, ready to adapt. As you can see from the video, it holds up nicely. Being on the longer end, there is considerable "jello" (DSLR sensor-related wobble) but while following fast cars or completely locked off, that is hardly an issue. 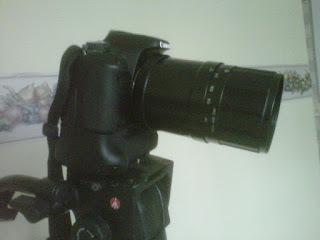 The biggest problem I found was that the lens is a fixed-aperture lens. It's f/8 and f/8 only. Normally, I would've loved to stop down on a long lens like this and increase my DoF. But of course, compromises must be made if you want to save literally thousands of dollars on a telephoto lens like this. So I had to rack focus. Luckily there was time to practice - if I had to roll live, this would not have been the ideal lens, but shooting to edit leaves room to rehearse your shots and practice your racks... let me tell you, maintaining focus on cars going this fast towards and then past you is no easy task. Anyway, I managed and got what I needed for the job. I'm definitely looking forward to shooting with this bad boy again in June. Here are some selects using this lens (there's a lot more good stuff on this lens but until the film comes out, I'm limited to what I can show). 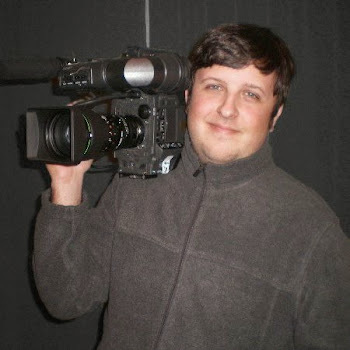 One of the most vital pieces of add-on gear a DSLR video shooter must have is a good loupe. A loupe is a viewfinder-like attachment that fits over the camera's LCD screen and gives you something like an EVF (electronic viewfinder). There are a wide variety of loupes available. 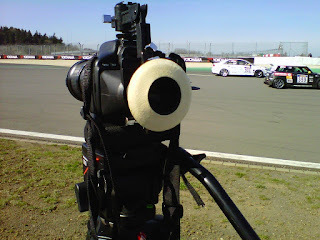 BorrowLenses.com has the Hoodman and Zacuto available for rent. Currently, I use the Hoodloupe by Hoodman. It's a simple design with a diopter (allows the finder to be adjusted for a user's eyesight) and a couple of mounting options. The one I use is the crane. It allows for precise adjustment of the finder's position and also let's you quickly remove and replace the unit. It requires no adhesives or anything like that. Brilliant design. My Hoodloupe fitted with a Bluestar chamois eye cushion. 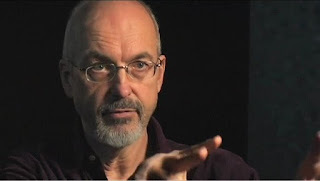 In the fall of '09, I shot a piece about video artist, Bill Viola and his innovative installation, "Pneuma." This was great to be a part of. First, I was really happy with how I was able to integrate the art into the interview shot. You'll notice the key is clean, but the fill (shadow side) on Mr. Viola varies depending on what the art is doing. It's subtle but I really dig what I came up with. Secondly, the interview was eye-opening. I had never been into video art before this job, but Bill Viola has an amazing approach to the medium, especially in this recent installation. Take a look at the video, and I'm sure you'll agree.